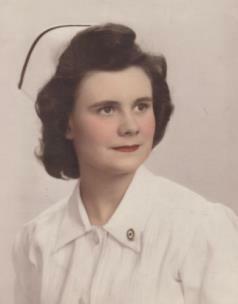 Helen Marie Saylor, 92, of Chattanooga, passed away on Wednesday, March 20, 2019, in a local hospital. She was born Sept. 18, 1926, in Chattanooga to the late Louis Edward and Bernadette Marie Klassen. Helen was a graduate of Baroness School of Nursing. She was retired from Memorial Hospital as the Director of Nursing Services following many years of service. Mrs. Saylor was a member of St. Stephen Catholic Church. She was preceded in death by several brothers and sisters. Survivors include her husband of 68 years, Charles Edward Saylor, Sr.; son, Charles E. “Chuck” Saylor, Jr. (Myra); daughters, Robin Baker (Mike) and Debra Hensley (Bill); brother, Jerry Klassen (Sandra); grandchildren, Matt Hensley (Jenna), Ben Hensley, Katie Hensley, Casey Cox (Perry), Charlie Saylor, David Baker, and Sarah Baker; great-great-grandchildren, Maddie Hensley, Max Hensley, and Addie Cox; and several nieces and nephews. Funeral Mass will be held Monday, March 25, at 11 a.m. at St. Stephen Catholic Church, 7111 Lee Highway, Chattanooga, Tn. 37421. The family will receive friends from 10-11 a.m. prior to the service. Father Manuel Pérez will officiate. Memorial contributions can be made to St. Stephen Catholic Church, 7111 Lee Hwy., Chattanooga, Tn. 37421. Arrangements are by the East Brainerd Chapel of Chattanooga Funeral Home, Crematory & Florist, 821	4 East Brainerd Road, Chattanooga, Tn. 37421.